Hey drivers: need a way to secure your phone in place, so you can use it without landing a big fat ticket? 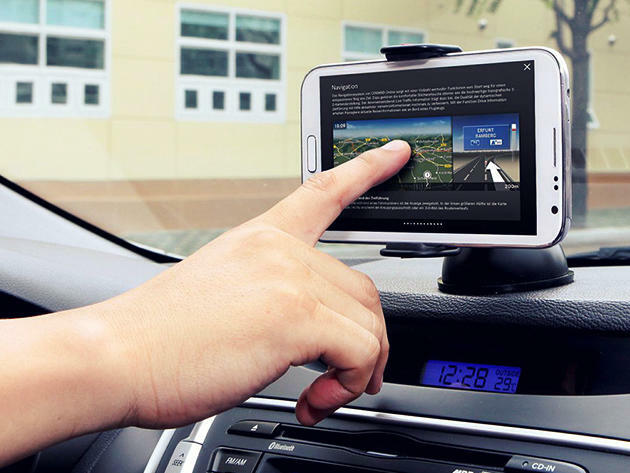 Then the ExoMount Touch Universal Car Mount should be in your car, stat. Grab it now for just $24.99, marked down from the original $29.95 in the Technobuffalo Deals Store. The ExoMount is designed to hold any smartphone on the market up to 3.46" wide, including most iPhone and Galaxy devices. Setup is easy: just stick its suction cup to any surface in your car — whether your dashboard or window — snap in your phone, and you're good to go. Plus, thanks to its 360 degree-swivel design, you'll can adjust it per your preference, making it as intuitive to use as possible. And here's a neat trick: the ExoMount works perfectly well outside your car too. Stick it to your desk, and you've got a handy way to mount your phone in place to seamlessly browse articles or use your favorite apps while at home. This holiday season, give someone the gift of safety and convenience: grab the ExoMount Touch Universal Car Mount for just $24.99, available at this discounted price for a limited time only.